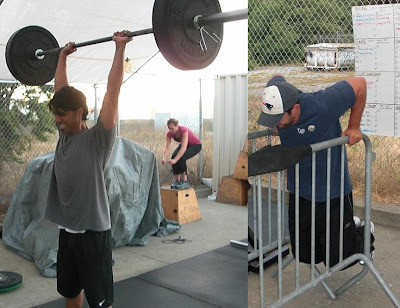 A big shout out to Roop and Mike M (from the A.M. crew) for attending the Crossfit Level 1 seminar this weekend. I was responsible for creating the workout on day 2 which involved not one, but 2 trips up the infamous CrossFit Games hill! Ask them how much they enjoyed it the second time around! Nice work, fellas. In other news, there are a bunch of freshly-printed shirts up at the box. If there's anyone who still can't find a size that works for them or if you live out of town and want me to mail one to you, I'll be doing a run of special-orders. 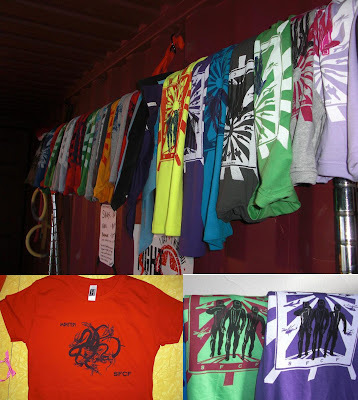 Email your size and design request(pictured below...monsters or space-men) to adrian AT sanfrancisocrossfit.com. ...and remember, new classes start Oct. 1st! Check the schedule on sanfranciscocrossfit.com for more details. I will take one hat. Also when do we get to experience GWAR in the morning? Thanks. There are still hats down there. Anyone who needs to order something, please email me!!! It makes it much easier to keep organized...if I don't get an email, your order won't get filled. Vlad, Vlad, Vlad the Impaler! I am still waiting for my banana hammock. Dude, you're all talk and no rock. The ball's in your court (no pun intended). Bring me a BH and I'll print it up. Or off, depending on exactly what you are doing in that banana hammock. I have one you can borrow. Hardly used. Was part of the "Party Boy" outfit Corrine got me for Christmas. Only saw the light of day once, when I gave my brother a preview of what I was planning to do at our family Christmas dinner (think tear-away pants and house music). Scarred him for life. I was told to burn the outfit.